'The ecological challenge demands a paradigm shift in our thinking about the human-environment relation. Reconciling Human Existence with Ecological Integrity provides a �state of the art� account of work on ecological integrity - and offers a compelling vision for the future.� Derek Bell, Senior Lecturer at the School of Geography, Politics and Sociology, University of Newcastle �A book of vast scope and richness … If policymakers around the world took notice of this insightful set of messages, we would all live with greater happiness, health, and wellbeing, with a brighter future for our children and grandchildren.� Lawrence O. Gostin, O�Neill Professor of Global Health Law, Georgetown University Law Center �This book attempts to do in theory what the world needs to do in practice. It is an ecological master plan that shows how we can not only survive but also flourish.� James P. Sterba, President of the American Philosophical Association, Central Division Ecosystems have been compared to a house of cards: remove or damage a part and you risk destroying or fundamentally and irreversibly altering the whole. Protecting ecological integrity means maintaining that whole - an aim which is increasingly difficult to achieve given the ever-growing dominance of humanity. This book is the definitive examination of the state of the field now, and the way things may (and must) develop in the future. 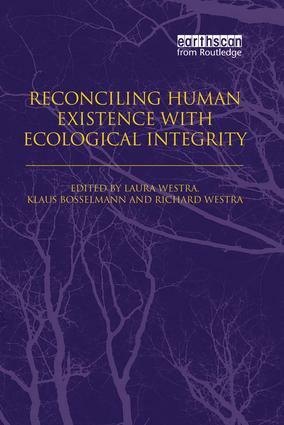 Written and edited by members of the Global Ecological Integrity Group - an international collection of the world�s most respected authorities in the area - the book considers the extent to which human rights (such as the rights to food, energy, health, clean air or water) can be reconciled with the principles of ecological integrity. The issue is approached from a variety of economic, legal, ethical and ecological standpoints, providing an essential resource for researchers, students and those in government or business in a wide range of disciplines. A Human Right to Water: An Ethical Position or a Realizable Goal?